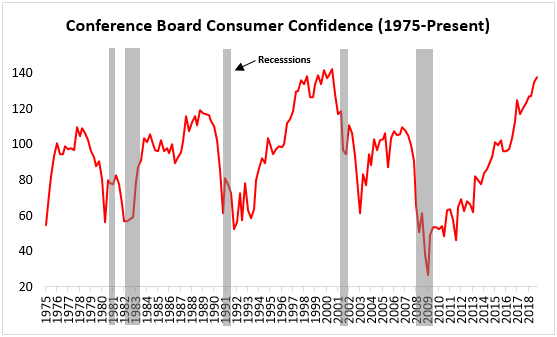 2.Past Periods of Elevated Consumer Confidence. Elevated consumer confidence – particularly when simultaneous with a >0% output gap and <4.5% unemployment rate – is more representative of peak than robust conditions. Current consumer confidence is at cyclical highs. Below, we can see that over the last 10 years, the least-expensive companies as measured by the price-to-earnings (P/E) ratio have outperformed their respective broad Russell Midcap and Russell 2000 indexes. The magnitude of this outperformance in the mid- and small-cap universe is significantly greater than in the large-cap universe because factor exposures are magnified in less-efficient markets. During this period, there has also been a positive spread in the performance of the lowest P/E quintile(undervalued constituents) and highest P/E quintile (overvalued constituents). However, we can see that the value versions of these Russell indexes, which are built by over-weighting companies with low price-to-book value (P/B) ratios, have lagged the broad indexes over the same period. The definition of value matters, and low P/B has lagged low P/E over the last 10 years. Low P/E Outperformed But Value Indexes Lagged? 4.Reminder How Much The Markets Like Santa. 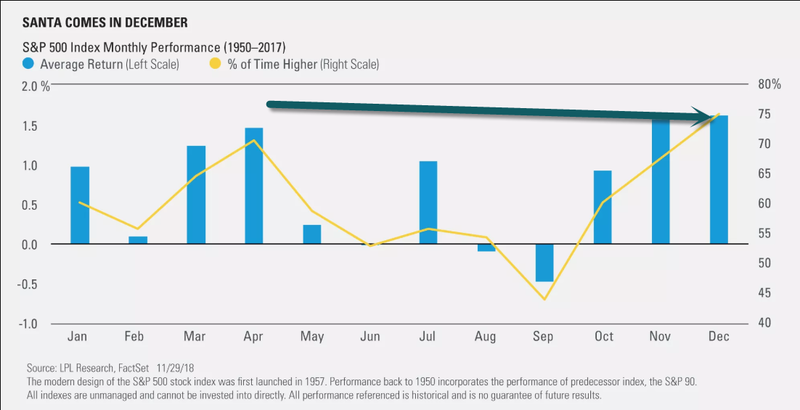 As our LPL Chart of the Day shows, since 1950, no month has a higher average return or has been higher more often than the month of December. 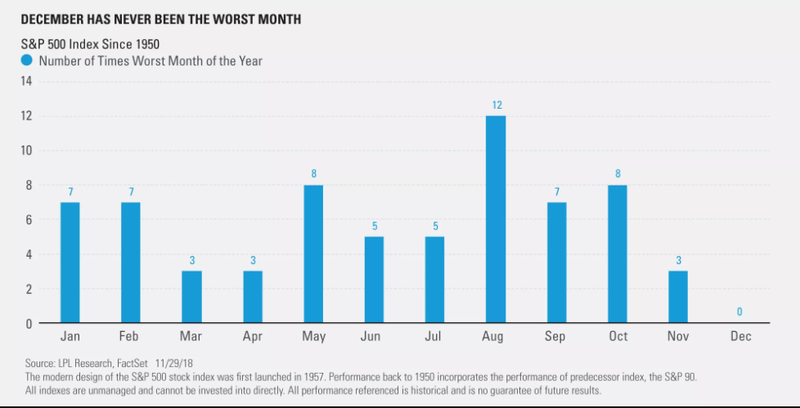 Last, an interesting stat: December has never been the worst month of the year for stocks. That’s right—since 1950, the S&P 500 Index has never had its largest monthly drop in December. Given that the worst month this year was October with its 6.9% drop, history would say to not expect a similar big drop to end 2018. 5.Chinese Tech Sector Massive Growth in 10 Years. 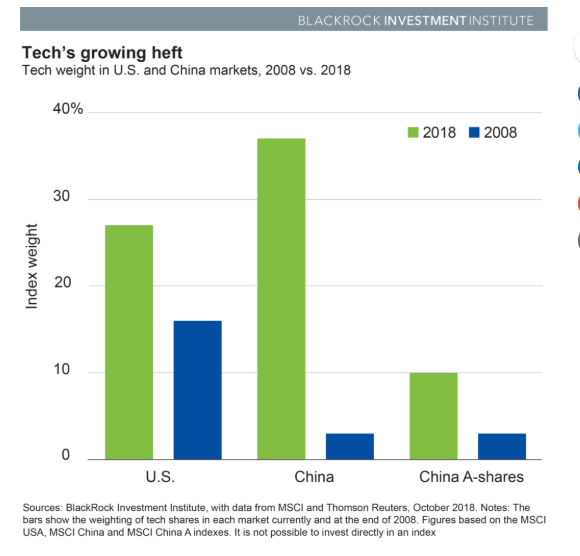 The Chinese tech sector has grown significantly in the past decade, as shown in the chart below, and has more wind at its back amid broad support domestically. 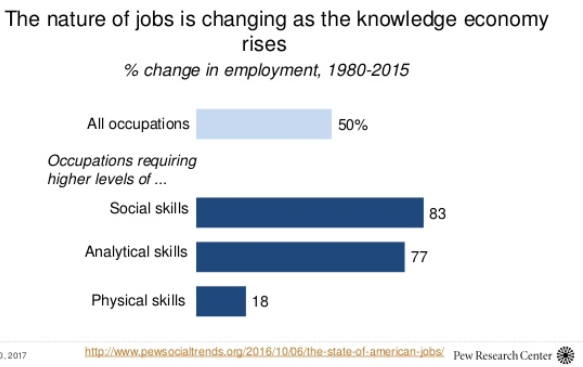 This could bode well for future growth and performance. What about stocks and rising rates? Many investors believe that rising interest rates are a harbinger of poor stock returns, and they have some solid reasons for thinking that. Higher rates make bonds relatively more attractive versus stocks. And higher rates slow overall economic growth, which weighs on corporate profits and stock prices. Financially savvy investors might also note that higher interest rates lower the value of future corporate earnings, thereby reducing their present value. The historical research we’ve done, however, doesn’t show a pattern of falling stock prices during rate-hiking cycles. In fact, hiking regimes often take place when the economy is performing strongly and earnings growth is robust, and therefore stocks tend to perform respectably during those periods. As the graphic below illustrates, in the 11 periods of rising rates we looked at over the past 50 years, stock market returns were positive in all but one of them. 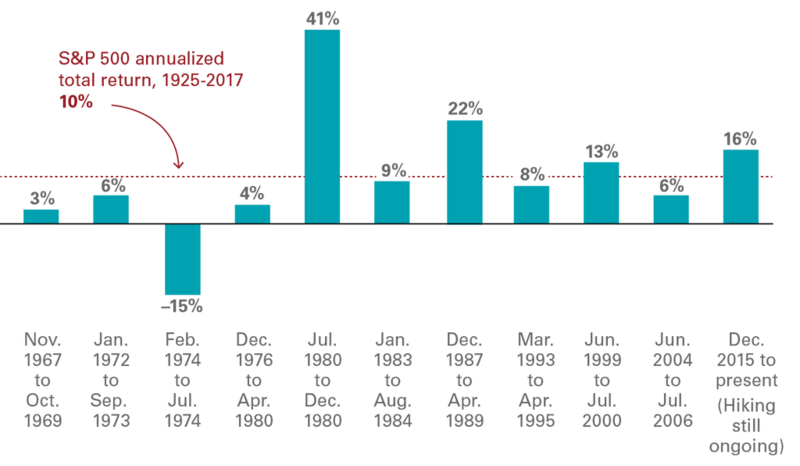 And even including the –15% return for the period in 1974, the return of stocks across those periods was in line with the 10% average for stocks from 1925 through 2017. During the 11 periods of rising rates that have occurred over the past 50 years, annualized total returns have been broadly positive and in line with historical averages. Note: Note: Return for latest hiking period is as of August 24, 2018. Sources: Vanguard calculations based on data from Bloomberg, St. Louis Federal Reserve database, and Moody’s Data Buffet. All equity calculations represent the S&P 500 Index. 7.Weed Space Showing Classic Signs of Past Bubbles with Small Floats are Shares. What’s really sent Tilray shares into space has been their scarcity, as American investors rush to board the weed train. Only about 10% of Tilray shares became free-trading in July’s IPO, and that small float has made Tilray stock hard to buy, borrow, or sell short. 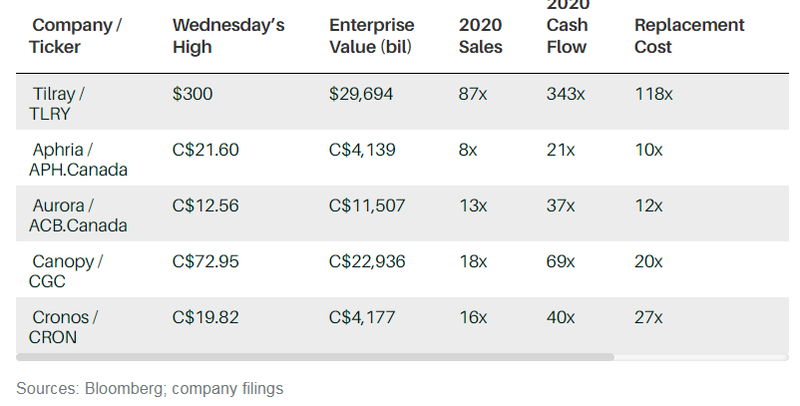 More than 100% of the Tilray float has been changing hands each day, since Canopy’s August deal with Constellation, and it’s pretty clear that U.S. retail investors are responsible. Several other cannabis companies are dual-listed in Canada and the U.S–including Canopy, Cronos Group , Green Thumb Industries and MedMen Enterprises–and the majority of their daily trading volume has shifted to the U.S. in the last month. That must be why Canada’s other big producers are reportedly beating a path to American exchanges. Both Aurora and Aphria ditched their U.S. subsidiaries this year, because operating in a country where marijuana remains illegal under federal law was an impediment to listing on the NYSE or Nasdaq. So U.S. investors will soon have other weed stocks to sample. Stock in leading Canadian cannabis producer Aphria was taking a nosedive Monday, as the company denied allegations by a short seller who said it had spent more than $200 million to acquire overseas companies of little value that were previously owned by Aphria insiders. In a presentation at a short-selling conference Monday morning in New York, hedge fund manager Gabriel Grego said his visits to the sites of three Aphria acquisitions in Jamaica, Colombia, and Argentina showed abandoned properties or tiny entities that Aphria trumpeted as its entries into those national markets. Grego urged attendees of the KASE Learning Shorting Conference in New York to sell Aphria’s NYSE-listed stock (ticker: APHA). Valued on the New York exchange at $2 billion, Aphria has been one of darlings of the Canada’s cannabis industry. Like many of its marijuana peers, Aphria has enjoyed a stock market capitalization that’s nearly 100-times its trailing 12-month sales. Aphria stock closed down more than 23% on Monday, to $6.05 per share. More than 35 million shares changed hands, more than 13 times the recent average daily volume. 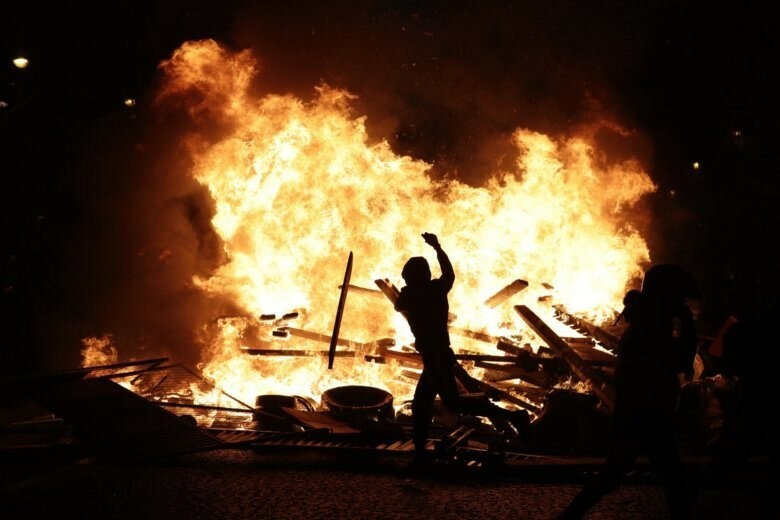 “We believe something very sinister may be happening with this company,” said Grego, who runs the hedge fund firm Quintessential Capital Management. “We believe insiders shop around emerging countries and buy worthless assets for themselves.” The insiders then sell the entities at marked-up prices to Aphria, Grego claimed. The idea for his Aphria short, Grego said, came from researcher Nathan Anderson, who published his own report on Aphria Monday morning on SeekingAlpha, under the moniker Hindenburg Investment Research. In his slides Monday morning, Grego presented public records showing that DeFrancesco works out of a Florida office property that he co-manages with Barry Honig, a controversial stock promoter that the U.S. Securities and Exchange Commission charged in May with running a $27 million stock manipulation scheme—charges that Honig is fighting. SEC filings show that DeFrancesco’s wife Catherine was a substantial backer of Honig companies like Riot Blockchain (RIOT). DeFrancesco told Barron’s that the Riot investment in his wife’s name was his own doing and has been a money-loser. “Guys who put companies together come across each other and co-invest,” he said of Honig. Honig had no involvement in the overseas entities acquired by Aphria, said DeFrancesco, nor did DeFrancesco have involvement in the Honig deals being challenged in the SEC’s suit. 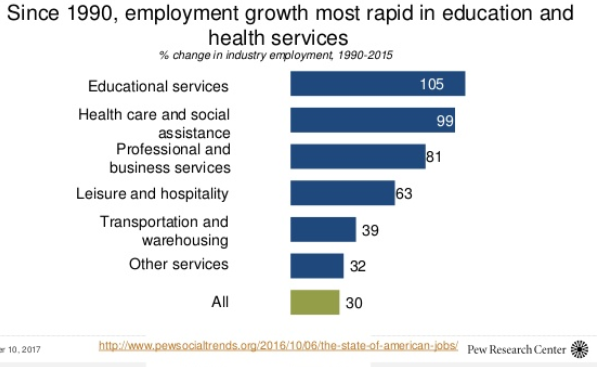 8.Since 1990 Highest Employment Growth Education and Healthcare. 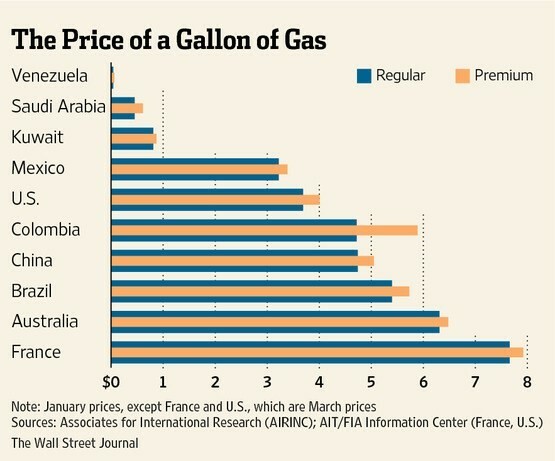 9.France Riots and Gas Prices. 10.Seven Things in Leadership that Require No Talent. Often times, we equate talent to what makes someone successful, leadership included. When I got my first leadership role in an organization, I assumed I would be successful purely because I had natural leadership talent. But boy, was I wrong. Not only did I fail, but I failed miserably because I tried relying on talent alone rather than strengthening my leadership skills. Looking at a study that was performed by The Leadership Quarterly on the skill set and human development within leadership, the results show that 24 percent of leadership skills is genetic and 76 percent is learned along the way. Essentially, the ‘natural born leader’ is a bit of a myth. Instead, leadership is something that you can develop and grow through strengthening a specific set of skills. It’s super irritating to a team when their leader says one thing and does another. While the position of leadership typically carries power and authority, it doesn’t give you the green light to be inconsistent. No matter how big or small, when you don’t do what you say you are going to do, it erodes your credibility, builds distrust and stifles momentum. Of course, we are all human and make mistakes. But the point is to be sure you aren’t known for being the leader who doesn’t keep their word. Once you’ve lost trust, it’s difficult to gain it back. Remember the main mission of a leader. Leaders have all kinds of responsibilities but none more important than elevating others. There are many things you can’t control when it comes to leadership and one of those is how people will look to you as an example. They are watching your every move like a hawk, whether you like it or not. It’s important you provide your team with something positive for them to emulate. Focus heavily on your actions each and every day to ensure they are worthy of being copied. There are no shortcuts on the road to success. If you want to become a better leader you have to do the work required to get there. Reading, practicing, and being intentional are all things a strong work ethic will take care of. A great way to be a better listener is to pick one person and anytime they say something, keep eye contact and don’t interrupt them under any circumstance. It’s a powerful way to get focused on using your two ears instead of your one mouth. The best part is you don’t need to be born with any special leadership DNA to implement and practice all of these traits. If and when you do start following them, your year will be filled with a lot of success as a leader.